DeLonghi's 2 Oz. 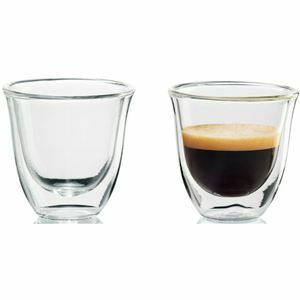 Espresso Glasses (2-pack) are made from borosilicate glass which makes it resistant to extreme temperatures and corrosion. The thermal effect of the double wall helps keep hot drinks hot and cold drinks cold. The double wall also prevents condensation and excess heat from reaching your hands. These glasses are comfortable to hold, dishwasher safe and perfect to use with any DeLonghi espresso/cappuccino maker.